The Offshore Renewable Energy (ORE) Catapult, in collaboration with Centrica, has successfully delivered the first in-field measurement campaign under its industry-leading blade leading edge programme (BLEEP) with ZephIR Lidar technology, and concluded that an uplift in annual energy production (AEP) of between 1.5 to 2% is possible following the repair of moderate blade erosion. 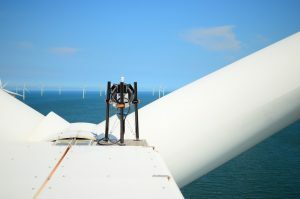 The measurement campaign, carried out on behalf of ORE Catapult by the Measurement Services Department at RES, in collaboration with Centrica and focussed on an offshore windfarm, used wind lidar ZephIR DM to accurately measure the power performance impact of blade leading edge erosion by assessing performance before and after blade repairs were carried out. The results will allow owner/operators to optimise their repair and maintenance strategies, balancing cost versus benefit in order to minimise levelised cost of energy impact and maximise revenue. The resultant method will now be used to carry out a further two measurement campaigns as part of the wider collaborative industry programme of works, to validate the results and the methodology used. Andrew Kay, ORE Catapult’s Innovation Manager, said: “Blade leading edge erosion remains a significant issue for the wind power industry. The outcomes from this project will help the industry to optimise blade maintenance informed by an understanding of both the cost and the benefit of repair work. “However, this measurement represents a single result from a single turbine type, site, and level of erosion. As such it is extremely important that further studies are performed to build a more complete picture of how the level of erosion, site, turbine and atmospheric variables influence the impact of erosion on performance. All turbines respond consistently to a moderate level of erosion, and no consideration is given to a change in level of erosion over time.